Late Maincrop - Well respected older variety. 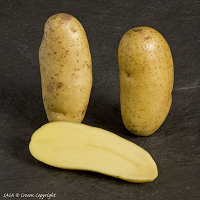 Named on the Isle of Arran after the first World War, this round to oval tuber has consistently been popular with growers due to high yields and long seasons. Distinct blue/purple skin covers white flesh. 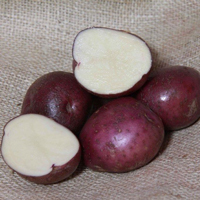 An oval white skinned and white fleshed potato is produced from this small grower favourite. 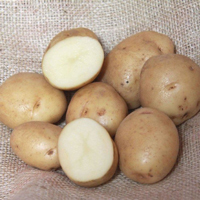 Popular for its versatility in the kitchen  another potato which needs gentle simmering to produce excellent mash, and a great roaster. Around since the 1930s and linked with the Duke of Burgundy through name, this red skinned and red fleshed variety is impressive from the start. 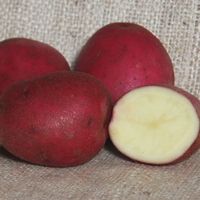 A joy to specialist growers it provides flavoursome potatoes which brighten up any dish, be it floury mash or red chips. Unfortunately we can't supply Mayan Gold this year due to quality problems. Early Maincrop; white with some blue; medium yellow flesh. We have just heard that we will be able to get Mayan Gold for 2017. 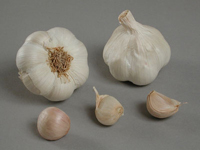 Its ancestors originated in the foothills of the Andes in Peru where they were cultivated by the Incas. The Scottish Crop Research Institute bred from them to produce varieties which are adapted to the European climate. 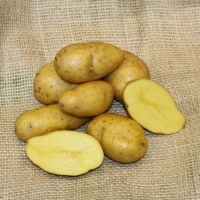 Mayan Gold is a golden coloured tuber with a nutty flavour anf floury texture which makes it excellent for chips, crisps and roast potatoes. Tests show resistance to late blight on foliage, common scab and powdery scab. We are currently waiting for an image we can use. Late Maincrop - Long and knobbly. 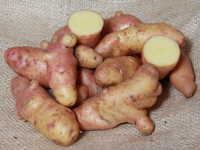 Tubers have good resistance to bruising and splitting. Trials have found good resistance to powdery scab, common scab, skin spot and dry rot Fusarium coeruleum. when the skins are left on the flesh itself has beautiful flavour when mashed with ample amounts of butter. Maincrop - Blue through and through. Both the skin and flesh are a strong, deep blue, which persists after cooking. 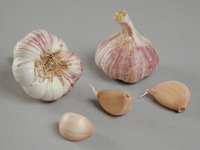 This variety has a high dry matter content so is not really suitable for salads, despite its name. However, it does produce good quality potatoes. 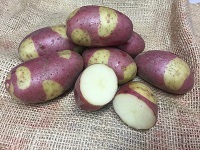 Maincrop - Netted dark blue skin and yellow flesh. Around since at least the early 1920s when it was added to the Victorian collection. Medium to long oval tubers and dark skin make for interesting cooking opportunities. 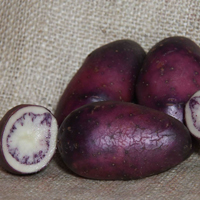 Flavour is good and the potatoes are easily baked, crisped, chipped and roasted. Potatoes delivery is based on weight, and it is calculated automatically as you add the nets to your basket. The banding is as follows: 1.0kg ~ £4.95; 2 - 3kg ~ £7.00; 4 - 18kg ~ £8.00. If you require more than 18kg please call for price (01354 740553). Why not share the cost by ordering with a friend?